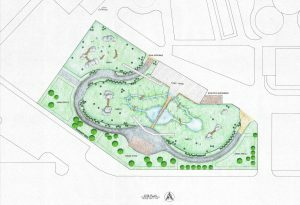 Amur Tiger River Valley will be built where the present-day duck pond is located, just east of the Visitors Center. The new habitat will feature three yards connected by overhead catwalks and an indoor habitat with a day room, individual dens and veterinary facilities. Donate now | Click here to help us reach our goal. 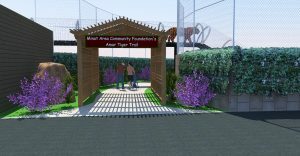 Features for our visitors will include an Amur Tiger Trail made possible by a $500,000 grant from the Minot Area Community Foundation. Along the trail, our visitors will walk under the catwalks, walk in and out of viewing range for an element of surprise and walk among the water features designed to mimic the Amur River Valley. 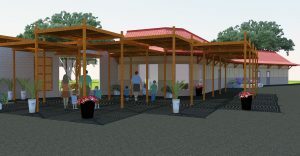 Along the building, there will be shade structures for both tiger and human, glass viewing for days of temperature extremes and water features to mimic the Amur River Valley. A Conservation Education Experience will highlight training sessions and keeper chats. *All renderings are a part of a working project and subject to change. Our male tiger Viktor is trained to stand on his hind legs so that our veterinary staff may visually examine his underbelly. Our female tiger Krapinka will present her paw against the fence so that keepers can be sure her nails are in good health. Trained behaviors like these help to maintain the safety of our animals and staff. It also helps to keep our animals comfortable. If they are used to turning their hip, it’s less scary to receive a vaccine in the same way. The new habitat is designed to foster that relationship between animal and caregiver as well as that between a child and the wild.